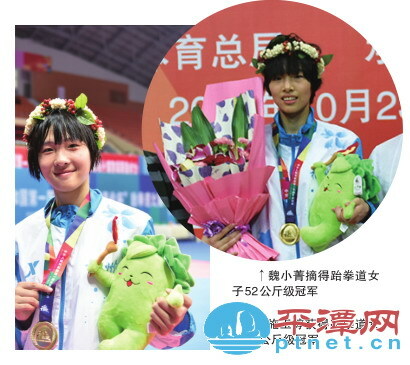 Two taekwondo players from Pingtan bagged two gold medals at the ongoing National Youth Games on Saturday, according to local news portal ptnet.cn. Both of them competed for the Fuzhou team. Wei Xiaojing won the women’s 52kg event after an 11-3 easy victory over Wang meichun of Xiamen, and Shi Yuting was the winner of the women’s 55kg event after edging out Li Xiaojie of Yangzhou 5-4. “It (a NYG gold medal) is only a start for Shi. I told her never to get complacent,” said coach Cheng Huiru. Shi said she will train harder to continue to improve her game.